In sports, great athletes achieve success with hard work, dedication and a passion to win. It takes guts and courage, too, to be successful. And, at times, it helps to have great bloodlines. Such is the case with Juan Matute Guimon, also known as Juan Matute Jr.
Matute Jr. has emerged in recent years as one of dressage’s best young talents. His family moved to Wellington from Spain in 2008. If you look at the career of his father, Juan Matute Sr., it’s clear that the younger Matute was born to follow his father’s accomplished footsteps, whose first big victory was at the 1982 Young Rider World Championships. During the elder Matute’s career, he won six Spanish National Dressage Championships and had three Olympic appearances for Spain. Currently, Matute Jr. is living in Spain where he’s competing in dressage and going to college at Madrid’s Universidad Camilo Jose Cela. He moved to Europe last year in pursuit of new challenges and experiences, both as an athlete and in academics. Balancing an athletic career with college is not easy, but he’s making it work. “It’s challenging psychologically and with time management,” he admitted. Matute Jr.’s most recent competition was a second-place finish in Doha, Qatar in February and a fifth-place finish at the World Cup in Lyon, France last November. According to his accomplished father, Matute Jr. is a better competitor now at age 21 than he was at age 21. 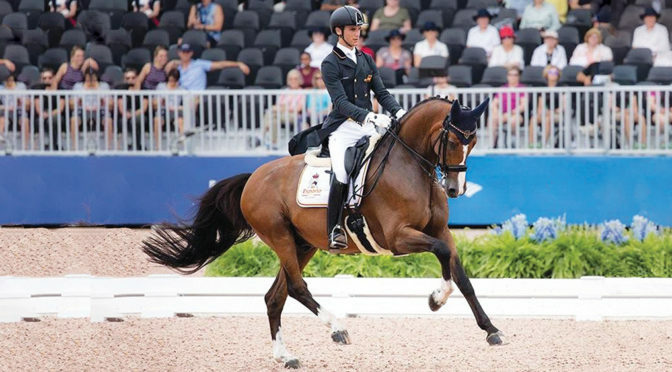 Right now, Matute Jr. is ranked in top five dressage riders in the world rankings of riders under age 25, and in the world’s overall top 60 riders. Matute Jr.’s career started in 2012, when he competed for the first time in a CDI Juniors while riding Don Diego. He eventually won that division’s gold medal at the European Championships in 2015 while riding Dhannie Ymas. In 2016, Matute Jr. had a banner year. In Wellington, he competed on 36 occasions, and he won 17 of them. That summer, he won the bronze medal at the Under 25 European Championships in Germany, aboard Don Diego. In 2017, Juan won a bronze medal with Quantico at the Under 25 European Championships in Austria. And in 2018, he won a bronze medal with Quantico at the senior Spanish National Championships and participated with the Spanish national team at the World Equestrian Games in Tryon, N.C. The greater dressage world offers high praise for Matute Jr.
“He’s honest, hard-working, and he’s had good guidance in life,” Olympic judge Gary Rockwell said. “He’s a real talent, following in his father’s footsteps,” German dressage rider Christoph Koschel said. “He’s a wonderful young man, and he’s very committed to the sport,” added Allyn Mann, director of strategic partnerships for dressage sponsor Adequan. As Matute Sr. reflects on his competitive days, one of his fondest memories was coming out of retirement and participating at the 2013 Nations Cup in Wellington, where his two children were his teammates and his wife Maria was the team chef. The Matute triumvirate won the bronze medal.